Casio has joined the wearable camera fray. The Casio Exilim EX-FR10 is a device has a unique ‘modular’ splittable design which consists of a round lens and a rectangular LCD screen equipped controller unit. There’s also a foldable dock and a wide range of straps and attaching accessories so you can film your extreme sport activities with ease. Casio says that the camera unit, which seperates from the screen unit with the touch of a button, allows innovative “freestyle shooting” as the user isn’t confined to holding the camera to frame and take shots. Furthermore, in the Casio press release today, we are told that Casio have made several attachment accessories to help ushers mount the Exilim EX-FR10 where and how they wish. Such flexibility should provide a lot of freedom with shooting angles for instance. Mounting accessories include; a multi-angle clip, belt set, tripod mounter and carabiner strap, a neck strap, a tripod nut – supplying lots of options above and beyond the split and hinged options already available. 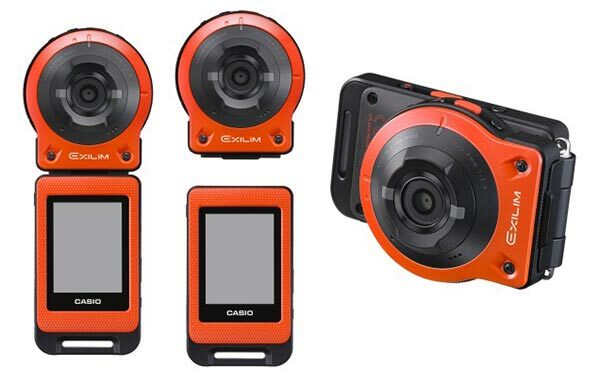 Also if the camera is perched precariously somewhere and falls it shouldn’t be too much of a worry due to its splash-proof and dustproof construction, also it “can withstand dropping from a height of up to 2.0 meters,” according to Casio. Making the most of its detachable lens unit the camera’s interval shooting helps the user appear more within the frame than just behind the camera. 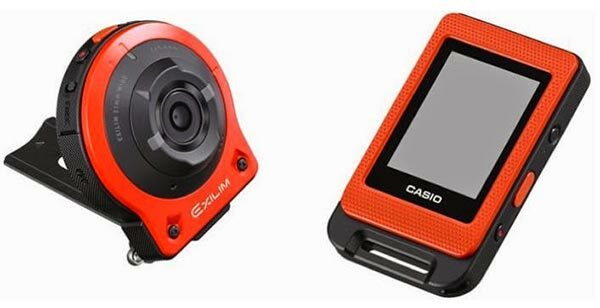 The two component parts of the Exilim EX-FR10 communicate via Bluetooth. Looking at the above spec the battery life is quite short at just over a full hour of recording. 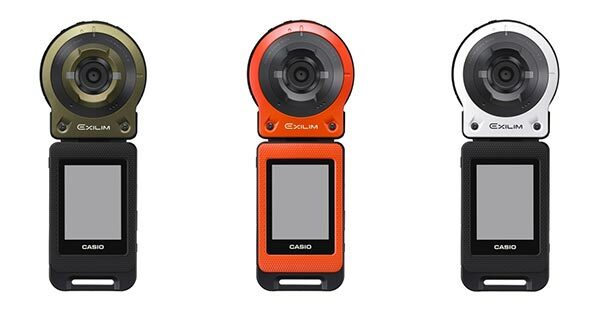 The Exilim EX-FR10 will be made available in orange, green or white in Asia and, in its launch market of Japan, costs ¥50,000 ($491) according to PCWorld.